ARRA News Service: Spending Revolt Bus Rolls into Arkansas . . . 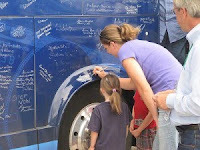 Spending Revolt Bus Rolls into Arkansas . . .
Teresa Crossland-Oelke, Director, Arkansas - Americans for Prosperity: In Washington DC, Nancy Pelosi and Harry Reid are digging a hole of debt that our children and grandchildren will pay for…they may never know the American dream because of this out-of-control spending. 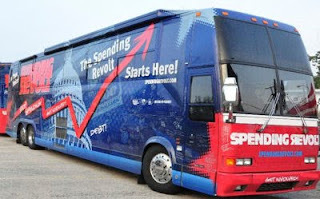 That’s why next week Americans for Prosperity Arkansas is bringing the Spending Revolt Bus Tour to Mountain Home, Harrison, Rogers, Fort Smith, Russellville, Conway, Little Rock, Cabot, Newport, and Jonesboro. We have excellent national speakers (see schedule below), great give-aways and you can even sign the bus with a personal message to Nancy Pelosi! Please help us get the word out and encourage your friends and neighbors to join you! Help us send a strong message to big spending politicians – Stop the Spending! Below you can find the date, time, and location for each city. New data from the U.S. Department of Labor show that 48 of 50 U.S. states are still losing jobs, while the federal government continues to spend at a rate of nearly $400 million an hour. In response to this looming crisis, the new Spending Revolt coalition – made up of taxpayers, families, business owners, and policy organizations – is working to educate citizens about how mounting federal spending is jeopardizing America’s future, and engage them in taking action against this reckless spending. The Spending Revolt National Bus Tour will roll across Arkansas for a series of events from Tuesday, Sept. 14 through Thursday, Sept. 16. The red and blue emblazoned Spending Revolt Bus is bringing speakers, events, and a mobile activist hub to communities across the state – and hundreds of other locations nationwide – to demonstrate how the federal government’s escalating spending spree is bankrupting American taxpayers. The federal government is currently spending $112,000 every second. This amounts to $67 million in the 10 minutes needed to take a shower and more than $1 billion in the 162 minutes that the average American spends watching television each day. 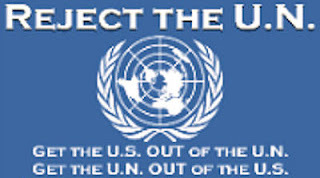 The national debt has ballooned to more than $13 trillion, and America’s debt is now projected to surpass GDP by 2012 – placing the U.S. closer to the crushing debt load that has engulfed Greece. Visit Spending Revolt online. Spending Revolt is a broad coalition of taxpayers, families, women, business owners, and policy organizations committed to real and permanent spending reform in Washington. The coalition is composed of organizations such as Americans for Prosperity, The Council for Citizens Against Government Waste (CCAGW), Concerned Women for America, and 60 Plus Association. Tags: Sending Revolt, Bus Tour, Arkansas, AFP, Americans for Prosperity, Concerned Women for America, Mountain Home, Harrison, Rogers, Fort Smith, Russellville, Conway, Little Rock, Cabot, Newport, Jonesboro, Herman Cain, Wendy Wright, Tim Phillips, Teresa Oelke, Dr. Bill Smith To share or post to your site, click on "Post Link". Please mention / link to the ARRA News Service. Thanks!